5,293 Global Earthquakes from 1973 to 2013. | Chaos Sweeps Away the World We Know! The Disaster, current events & Catastrophe Blog. Forecasts for 2014 to 2022. Read tomorrows news today! Plus current economic, commodities, stock indices and financial news. ← Picture of the Day – Blue Moon. April 9, 2013: 5,293 Global Earthquakes from 1973 to 2013: I downloaded all earthquakes, with a magnitude of 6.0 or greater, from January 1, 1973 to April 8, 2013. This produced a data set of 5,293 global earthquakes, which I analyzed using an Excel spreadsheet. The Earth’s equator is zero degrees Latitude, and is a 25,000 mile line dividing North and South Latitude. The results of separating those earthquakes into North or South Latitude are shown in the graph above. 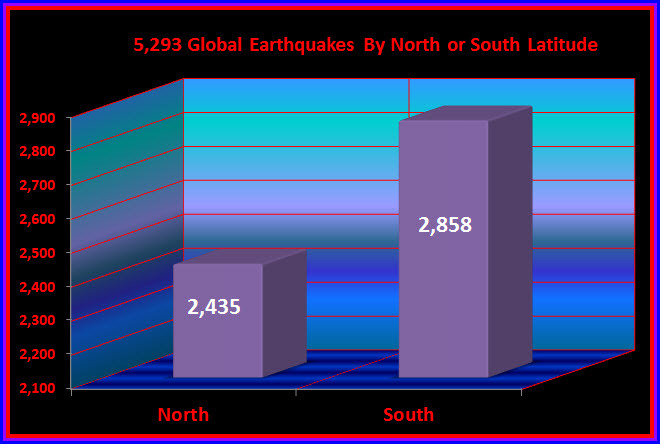 As you can see, the South Latitudes had more earthquakes than the North. The average (mean) is 2,646.5 earthquakes. The South had 211.5 more quakes than the mean and the North had 211.5 less. The South, in total, had 424 (211.5 + 211.5 +1) more earthquakes than the North. The south had 54%, while the north had 46% of the total. The reason for the difference is due to the fact that the South Latitudes include most of South America and the South-West Pacific Ocean Region of Sumatra, Tonga, Fiji, The Solomon Islands, Australia, New Zealand, Indonesia, New Guinea and Samoa; which are more earthquake prone. The North Latitudes include North America, Alaska, most of the Alaskan Aleutian Island Chain, Japan, the Russian Kirul Island Chain and the Russian Kamchatka Peninsula. These regions mark the Pacific Ocean “Ring of Fire,” where over 80% of the worlds earthquakes take place. This entry was posted in Alaska Earthquakes, Aleutian Islands Earthquakes, American Samoa, Australia, California, Canada, Chile, Earthquake, Events, Fiji, Indonesia, Japan, Kamchatka Peninsula, Misc, Miscellaneous, Nature, New Caledonia, New Zealand, News, North-East Pacific, Pacific Ocean, Papua New Guinea, Papua New Guinea, Peru, Peru-Bolvia, Philippines, Ring of Fire, Russia, Samoa, South Pacific Ocean, The Kingdom of Tonga, The Ring of Fire, The Sandwich Islands, The Solomom Islands, United States, Vanuatu and tagged 5293 global earthquakes from 1973 to 2011, alaska, Aleutian Islands, american samoa, Australia, Chile, columbia, Earthquake, earthquakes divided by north and south latitude, fiji, indonesia, Japan, java, java trench, kamchatka peninenusl, kamchatka peninsula, kuril islands, Latitude, new guinea, new zealand, pacific ocean, Papua New Guinea, Peru, russia, samoa, san andreas fault, Solomon Islands, south america, the kirul islands, The Master of Disaster, The Ring of Fire, the solomon islands, tonga. Bookmark the permalink.